The Porta 200 semi nesting chair solves the increasing problem of transporting heavier patients within hospitals, with a carrying capacity of 200kgs (30 stone). The Porta 200 has a very robust, fully welded steel frame; drop down arms for side transfer and a wide sliding footrest. 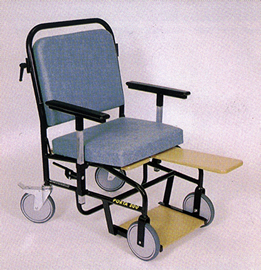 As a semi nesting wheelchair, space is optimised in out-patient and A&E departments. The chairs are upholstered in flame retardant vinyl fabric to BS5852 in the colour of your choice from the Chieftain/Just Colour range of fabrics, which have been proved to counteract C.diff, E-Coli and MRSA – Click below for available colours.